US Secretary of State Mike Pompeo has said it is Myanmar’s responsibility to take back its one million plus forcibly displaced nationals from Bangladesh without any form of fear and persecution. 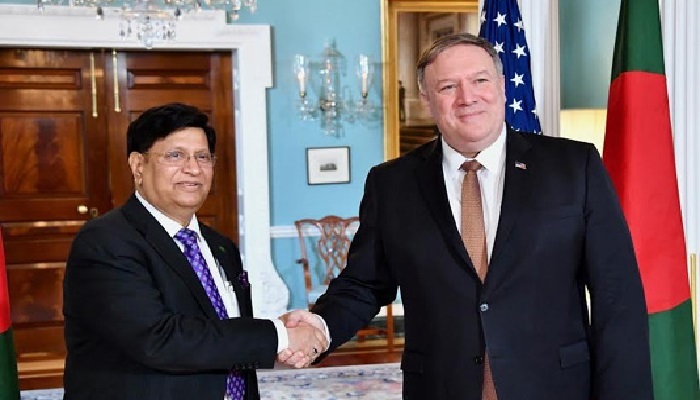 The US secretary of State made the remark while Bangladesh Foreign Minister Dr AK Abdul Momen held the maiden meeting with him at the US state department in Washington DC on Monday, according to a message. During the meeting, Pompeo reiterated that US would stand beside Bangladesh both politically and financially in finding a permanent solution to the Rohingya crisis. He also lauded the humanitarian gesture of the Bangladesh government led by Prime Minister Sheikh Hasina for temporarily sheltering the persecuted Rohingyas. Momen informed that Bangladesh at its own expense has turned the island “Bhashanchar” into a livable place in which one lac Rohingyas are planned to be relocated in coordination with UN agencies and different aid groups. Bangladesh foreign minister sought US support in creating a safe zone in Myanmar’s Rakhine State monitored by international human rights groups. in multiple sectors came up in talks. This is essential to carry out a vital common agenda of both countries pertaining to Counter-terrorism and Countering-Violent Extremism and upholding rule of law, he said. In that respect, leaders of the region need to work together on issues such as governance, accountability, rule of law and maritime security, they observed. Mentioning that Bangladesh is lauded internationally for its impressive development journey, Momen sought more investment from the USA in the oil and gas sector and US presence in the Special Economic Zones. He also sought US support to the candidature of Bangladesh in the upcoming election to the post of Deputy Director General of International Organization for Migration (IOM). Later in the day, the visiting Bangladesh Minister held meetings with senior officials of the US State Department and Deputy National Security Adviser Charles Kupperman. Bangladesh Ambassador to the USA Mohammad Ziauddin accompanied the Minister at the meetings.